Photos of a student driver who flipped the car are funny. What makes it weird and an example of Abundance is how I heard about it. My friend, John, sends me a lot of links to funny or important news and just things he finds that might interest me. 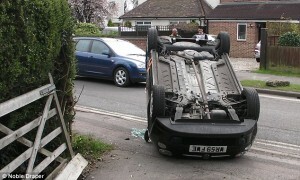 John sent me the link to the article about the student driver in England who flipped the car during her lesson. When I read the article I was surprised to see that it happened in front of the home of one of my friends, Dermot. John does not know Dermot so that makes it more of an interesting coincidence, or is it? I spend a lot of time online and John sends me over 20 links a day. Each of these are things he and I share a common interest. Dermot and I also share similar interests. A car flipping over is something that Dermot would be very interested to investigate, especially if it happened in front of his home. Further more Dermot and myself are the type who would be good for a reporter to speak with. The shared interest made it more likely he would be on the scene of a random event and more likely that I would read about it. This is part of the Long Tail Effect. I am able to be friends with John and Dermot because of technology. Without all of us having access to this technology we never would have met or maintained our relationships. Also, this story was shared because of technology. The ease of finding and sharing stories of common interest made it more likely I would run across this story that mentions my friend from another country. Finally, I sent the link to the email list which Dermot is a member. Dermot may have not known he was quoted in the article but in a matter of minutes the story circled the world back to him. This is all possible because of the innovation and Abundance it creates. Things that would have been impossible even a few years ago are now so easy and inexpensive they are common place.